We began the next day with a delightful breakfast in Lucca and then set off for the Chianti region to visit a few villas. Among my favorites were Casina di Mello, La Corte di Campalli, and Le Porciglia. Luxurious villa Casina di Mello has a large pool and pool house surrounded by lemon trees, an outdoor dining area with a barbeque and lush gardens. Villa La Corte di Campalli was built in 1029 and features six bedrooms decorated with antiques, a small chapel, a wine cellar and an olive press. Four-bedroom villa Le Porciglia is colorful, stylish and spacious. We managed to carve out time for a delicious lunch at Ristorante Carloni on via Giacomo Puccini in Gaiole, an unpretentious local restaurant. I dined on brochette, a tomato and mozzarella salad, Tuscan bean and lentil soup, and porcini mushroom ravioli, followed by a profiterole and cantucci con vin santo—simply amazing! It may have been my favorite meal of the trip. We made it back to Lucca rather late after a wonderful stretch of villa visits. Not too late for dinner, however, which put the finishing touch on our day. We enjoyed a light meal of beef carpaccio and roasted vegetables at Trattoria da Leo, a Lucca hang-out featuring a warm, inviting atmosphere and lively crowds. The next day we visited more villas and apartments in the Lucca area. I was impressed particularly by Compignano West and Al Valentino. Compignano West is a sweet English country-style house with views down a valley filled with olive trees out to distant mountains and a more distant sea. Al Valentino is a deluxe residence just outside the town of Massarosa. Whoa. The villas are incredible but I'm getting ahead of myself. 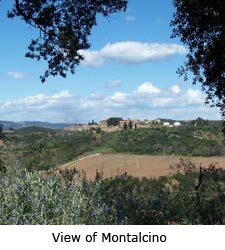 I happened to be visiting Tuscany at a historic time and it all became more than clear to me as I walked towards the car at one point and heard the sound of church bells echoing through a valley of olive groves from the village below. Lots of church bells. It was then that we knew that a new Pope had been chosen. It was stirring, especially so for me, standing on hallowed ground only miles from the Vatican itself. I dined at Leo's one more time and the next day we were off to Montalcino—my favorite town in Tuscany, a quintessential hilltop village with wonderful shops and art stores lining narrow streets on steep urban hills. 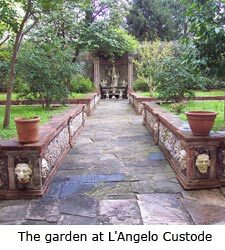 Among the villas in this area is villa Fontanelle, 15 minutes from Montalcino. It radiates color and comfort, with gorgeous views and incredible art. 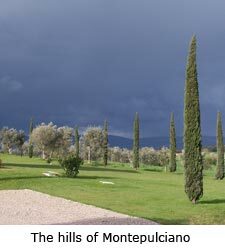 For lunch, we ate at l'Antica Cantina del Brunello in Montalcino. We had a little of everything: cheeses, meats, crostini with porcini mushrooms, salad and bread—all accompanied by a glass of Brunello. Oh, to spend more time in this adorable little village. We had dinner at Buca di San Antonio in Lucca that night. Talk about atmosphere! Copper pans hanging from the ceiling, dried herbs, good-looking waiters, complimentary appetizers and champagne... I had a salmon dish with a white wine herb sauce and cooked vegetables. Nathalie had a stuffed courgette. We awoke to a beautiful day and visited more villas in Lucca. I was really impressed with villa rentals Damiano and La Sorgente. Damiano is a terrific residence near San Martino in Freddana, a cheerful place with colorful décor. The same owner runs La Sorgente, with two wings of bedrooms and incredible views from every window. For lunch, we went to a little local restaurant called Ristorante Castello in Camaiore. I ordered their "famous" tortelli meat-filled ravioli, purported to be the best in Lucca. We were graced with Wimco villa the next night at villa Borgo Bernardini, and what a place! We languished in this restored hamlet, and after being wined and dined by villa staff we took the five-minute walk to La Cecca for a very rich spinach gnocchi and a courgette. And as for dessert—of course, tiramisu. The end of our trip brought us back to Florence where we checked into the Palazzo Magnani Feroni. 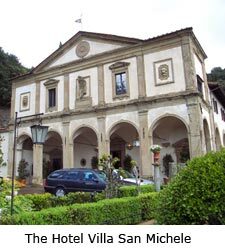 Local visits included the hotel Villa San Michele—we dined out poolside on smoked salmon, tomato mozzarella salad and grilled sea bass, accompanied by a delightful pinot grigio. Several desserts followed including a cappuccino concoction with homemade cinnamon ice cream, then tiramisu and a pistachio pastry with a mango sauce. As the day waned we thought about dinner, yet again. This time—Trattoria Dante, right across the street from Palazzo Magnani, a source of wonderful local atmosphere, affordable food, really good pizza, a mushroom penne to die for, crostini, and, yes, tiramisu. And I would be remiss if I didn't report on one very special restaurant in Florence that remains on my list of top choices. It is called Trattoria 13 Gobbi on Via del Porcellana in Firenze (Tel 055-284015 or 055-213204). It is about 10-15 minutes on foot from the Ponte Vecchio in a very non-touristy section of Florence. Simply wonderful! And, reservations are a must.